Michael R. Bloomberg, founder of Bloomberg L.P., philanthropist and former Mayor of New York City, Monday announced the launch of the Bloomberg Media Initiative Africa, a three-year pan-African program to build media capacity, convene international leaders and improve access to information in order to advance transparency, accountability and governance on the continent. The initial focus of the $10 million commitment will be on Kenya, Nigeria and South Africa. Timely and accurate reporting of business and financial matters play a critical role in advancing efficient markets and is a key driver in supporting economic and social growth. Strengthening business and economic news coverage, expanding training programs for journalists and providing greater access to reliable data about Africa are frequently cited as important enablers to the continent’s continued development. Bloomberg will partner with preeminent faculty from the University of Nairobi’s School of Journalism and Mass Communications and Strathmore Business School in Kenya; the University of Lagos’s Department of Mass Communications and the Pan Atlantic University’s Lagos Business School in Nigeria; and the Rhodes University’s School of Journalism and Media Studies and the University of Pretoria’s Gordon Institute of Business Science in South Africa to develop and deliver educational programs focused on business, economics, public policy, finance and journalism to enhance the skills and knowledge of media professionals. In collaboration with partners including the Ford Foundation, Bloomberg will host annual forums for African leaders and international experts to examine emerging trends and discuss media best practices. There will be a fellowship program to reward and enhance excellence in media. Bloomberg also plans to collaborate with the Ibrahim Foundation and ONE, as well as international institutions such as United Nations Economic Commission for Africa (UNECA) and the African Development Bank (AfDB), on a feasibility study to explore a platform for accessible, comprehensive, accurate and up-to-date economic data and information to promote African development. 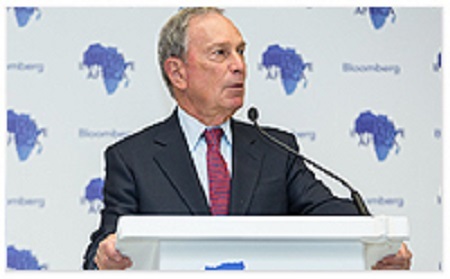 The Bloomberg Media Initiative Africa furthers Bloomberg’s philanthropic efforts on the continent. Bloomberg’s foundation, Bloomberg Philanthropies, has supported projects across Africa including women’s economic development, malaria research, maternal health, road safety, tobacco control and helping cities reduce their carbon footprints through C40 Cities Climate Leadership Group.